Family Sleuther: Why Did the Value of an Ohio Frontier Farm Spike in 1835? Why Did the Value of an Ohio Frontier Farm Spike in 1835? 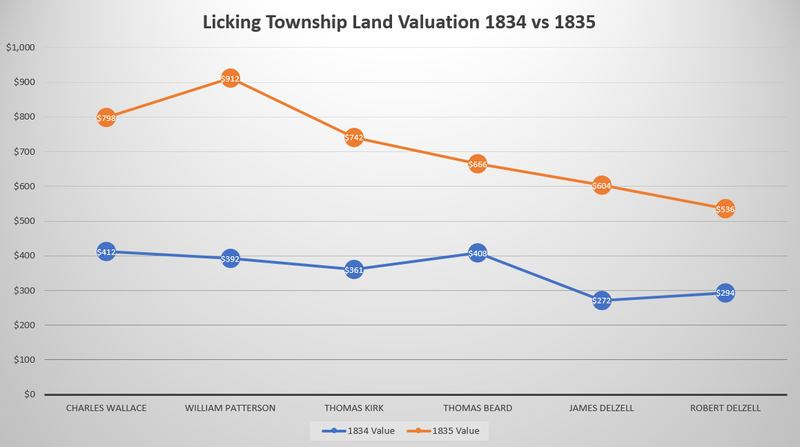 By 1805, Thomas Kirk had settled on 100 acres in Licking Township - a fledgling central Ohio settlement that was sparsely inhabited. Beginning in 1806, Thomas paid a 65-cent tax on those 100 acres. The assessed value of his land was based on the soil quality. Ohio's Department of Taxation explains that, "Laws were enacted during the frontier period to tax land on the basis of three grades of soil quality." For Thomas, that assessment varied over the years. For example, in 1806, his land was classified as 2nd Rate Soil, but in the following four years (1807-1810) it was assessed as 3rd Rate Soil. Was the devaluation due to a few unfortunate years of poor crop yields? Or was Ohio still trying to figure out its benchmarks for the different soil qualities? Between 1811 and 1825, the land was again valued as 2nd Rate Soil (note that tax records are missing for 1813 and 1815; maybe due to the War of 1812). In 1826, the tax records became more comprehensive. In that year, for the first time, an estimated dollar value of Thomas' land replaced the soil quality valuation. Ohio's Department of Taxation explains that, "The middle 1820's saw an end to the practice of taxing land based on soil quality as part of a compromise to win support for the building of the Ohio canal system. The new practice was to tax land at its true value. State officials believed that where canals ran, land values would rise and with that tax revenues would increase, too." In 1826, Thomas' 100 acres were valued at $361. That was an impressive 106% increase in value over his purchase price ($175) just 14 years earlier (note that Thomas paid tax on his 100 acres beginning in 1806, but didn't formally purchase the property until 1812). During the next nine years (1826-1834), his land was consistently valued at $361. However, a significant spike in valuation was on the horizon. In 1835, the annual tax assessment valued Thomas Kirk's 100-acre farm at $742 (a 324% increase over what he paid for the land in 1812). Thomas Kirk's wife, Sarah Bonar, died in 1835 after 30+ years of marriage and 13 children. Was there a dowager/estate consideration? The National Road - the first federally-funded paved interstate road - abutted the southern border of Thomas' farm. The road was completed in Licking Township sometime between 1830 when it reached Zanesville to the east and 1833 when it hit Columbus to the west. Did the road swing the market value for his acreage? I decided to put the question to the genealogy community on Twitter. In a few minutes, I had some solid recommendations for research next steps. The top recommendation was to see what happened to the land values of Thomas' neighbors. Did their property also see a significant valuation increase between 1834 and 1835? If the National Road was the cause for the valuation spike, surely the neighbors would see the same change. 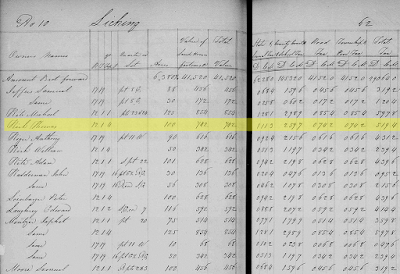 The immediate challenge to this research angle was determining who were Thomas' neighbors. The tax records were enumerated by surnames in alphabetical order. Thomas Kirk was listed with all of the other men in Licking Township whose surnames began with a 'K'. The tax lists were stripped of geographical context. 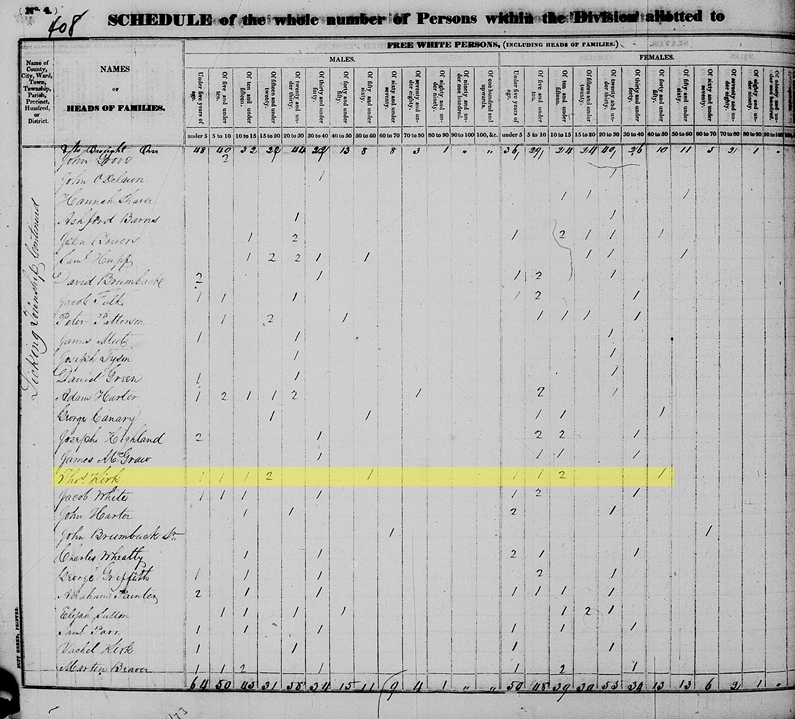 While the 1820 US Federal census also enumerated households in surname alpha order, the 1830 census - the US Federal census closest in time to the valuation hike - departed from that approach. Heads of household were recorded in the order that they were visited by the enumerator. Of course, that begs the question: In which order did the enumerator visit households? Presumably in geographical proximity. 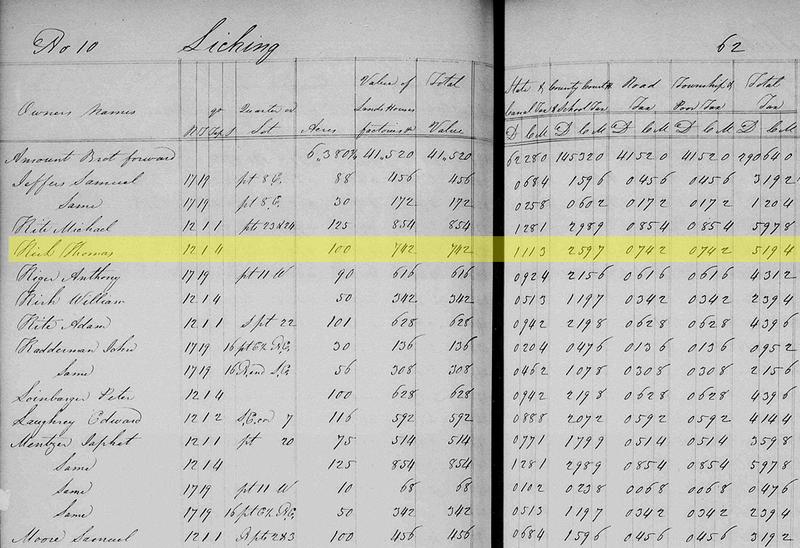 In 1830, Thomas Kirk and his family were among 794 other individuals enumerated in Licking Township. 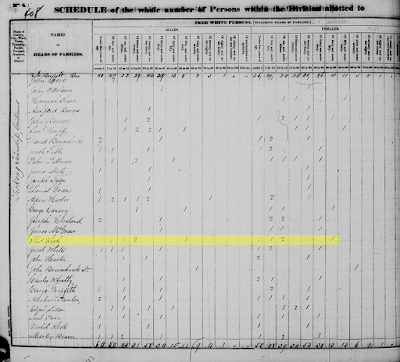 Of the six census pages for the township, Thomas was one of 27 heads of household enumerated on his census page. I focused on the ten heads of household immediately preceding Thomas' name, and the ten heads of household who immediately followed his name. Without knowing exactly where these men lived in relation to Thomas Kirk, I opted to snoop into all of their land valuation rates. Did they also see a sizable valuation increase from 1834 to 1835? 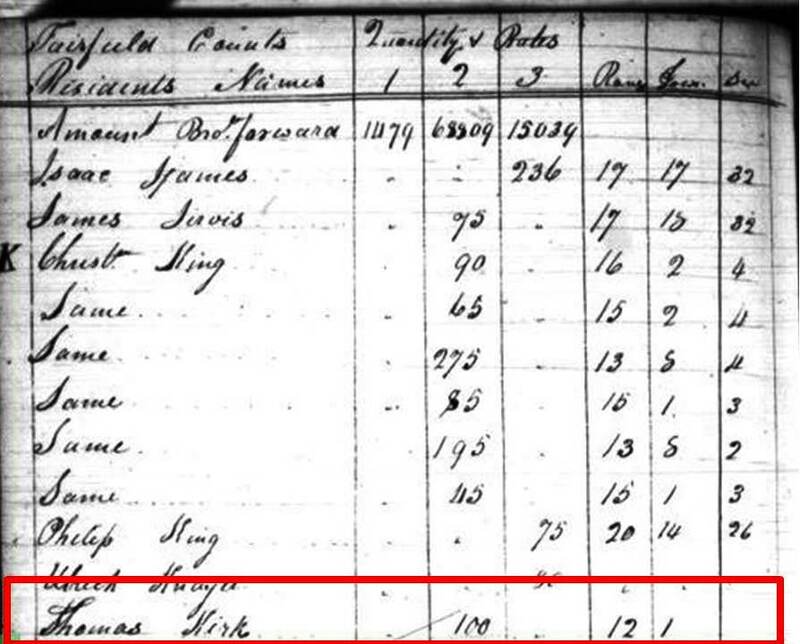 Of the twenty men who sandwiched Thomas Kirk on the 1830 census page, the tax records revealed that only four of the men lived in the same Range, Township, and Section as Thomas (Range 12, Township 1, Section 4) - meaning they were more likely to be his neighbors. All four of them saw an increase in their land's value between 1834 and 1835. Great for them! But I still wasn't certain if they were Thomas' next door neighbors, and, therefore, a good proxy for judging the spikes in property value. My next step - and where I probably should have began - was to examine the deed of sale from March 1838 where Thomas Kirk sold his 100 acres in Licking Township to Charles Wallace. The document described the boundaries of the property, noting that it was "bounded as follows:"
That land record reminded me of a framed map that hangs on the wall of the Licking County Recorder's Office in Newark. Purportedly from around 1847, the map details property owners in that year. I had snapped a quick photo of Licking Township when I visited the office two years ago. and the section boundary running along the south. 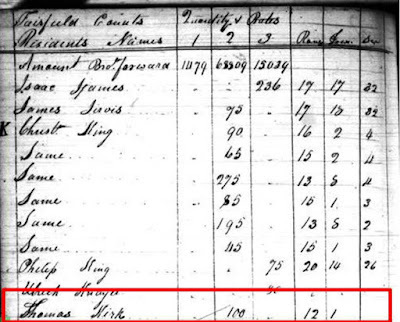 Isn't it curious that none of these men were on the same page of the 1830 census with Thomas? What path did that enumerator take?! So the big question is: What happened to the value of these men's land between 1834 and 1835? With a map in hand, I opted to expand the exploration another property or two on each side of Thomas' next door neighbors. 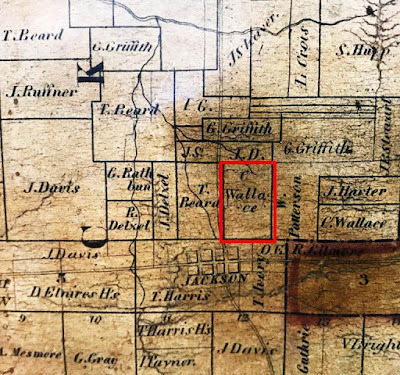 If you follow the map above, beginning with "C.Wallace" on the far right and working left to "W.Patterson", "C.Wallace" (the former Thomas Kirk property), "T.Beard", "J.Delxel", and then "R.Delxel", I tabulated the value of each plot of land in both the 1834 (blue) and 1835 (orange) tax records. All of them saw sizable percentage increases year-on-year. Everyone's property value was on the rise. Indeed, Thomas Kirk was in good company and, apparently, keeping up with the Joneses. I still don't know what happened in 1835 that led to the spikes in property value. The land belonging to each of these six men ran north of the National Road, and all experienced double and some even triple digit increases. Were they just in the right place at the right time (location, location, location!)? 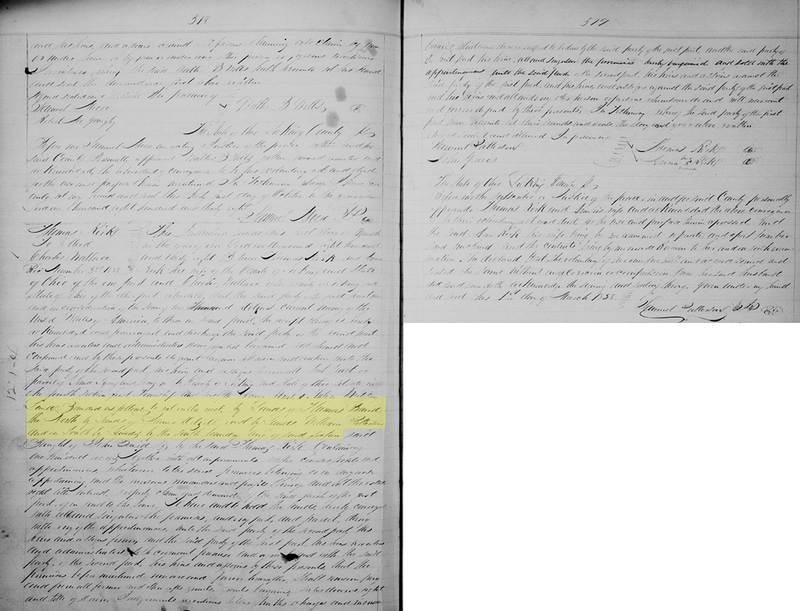 Looking at the assessed value for two years prior to 1834 and two years after 1835, I learned that - like the value of Thomas' farm - the value of these men's land remained static. In other words, the value that was assessed in 1834 was exactly the same as the assessed value in 1833 and again in 1832. Likewise, the higher assessed value from 1835 remained the same in the ensuing years 1836 and 1837. Apparently, land valuation wasn't updated on an annual basis. Or, if it was, land values were holding pretty darn steady. The static dollar amounts make me wonder if the tax laws in Ohio changed in 1835 and necessitated a review of how land was valued or just a periodic update, which resulted in a rise at the same time for all taxable residents. If that was the case, then it's certainly possible that Thomas and his next door neighbors saw a spike in their land's value because of the proximity to the National Road. 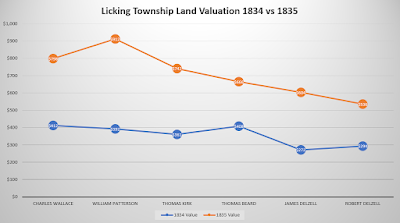 But it also could have been because the value hadn't been reviewed in years and it was just a natural property value rise resulting from the growth of Licking Township, which was more developed and populated. Indeed, a rising tide lifted all boats. What do you think? Why did land values rise sharply in 1835? When I saw your query on Twitter, my first thought was to check the neighbors but someone had beat me to it. Yes! was my reaction when I saw you didn't stop with the census but checked the actual neighbors who lived on the land surrounding Thomas. Kudos for good research and a great post. Sorry to say I have no idea why the land values rose sharply in 1835. A new recommendation I had was to review any surviving newspapers from 1834/1835 to see whether news of the valuation hike was covered. There were papers for the time period (at least 3 according to Chronicling America), but surviving issues are sporadic, offering spotty coverage. None are digitized; all are tucked away in Ohio archives in Columbus and Cleveland. I need to road trip! Good suggestion. People really need to know when they find old newspapers in their attics or wherever, they should turn them over to institutions who can scan and add them to their collections. 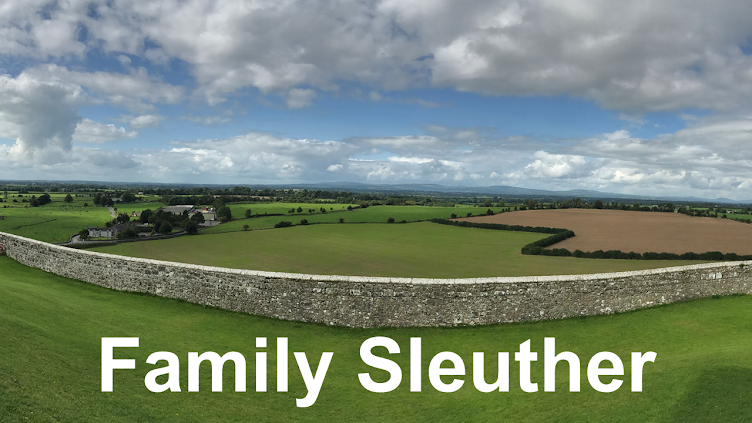 This is something I did not realize until this past October when we had our genealogy and family history day in Luxembourg. The librarian of the Luxembourg National Library told me how exciting it is for them to receive old newspapers from people. Very often they are ones they were missing! And all of them are online and free. How I wish this was the case for small local papers in the states I research. Chronicling America is the best but as you say, the coverage is spotty. Online and free are important! I appreciate the archives and libraries that collect and preserve these materials like those in Luxembourg and Ohio. I also thought---check the neighbors. I also wonder whether the entire area saw increases. It could have been a reassessment of taxes throughout the area. Maybe they needed to raise the money to build the road? Or for other public projects? I need to examine the area more broadly - further away from the National Road - to get a better sense of how widespread the valuation increases were. It may be that it was just time for a hike. Best of luck---let us know what you find.